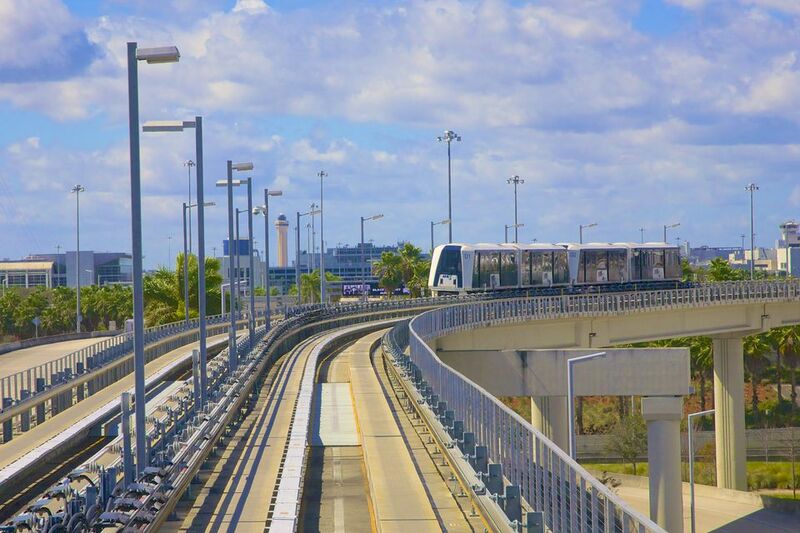 Miami’s MetroRail public transportation system now serves Miami International Airport (MIA)! After decades of waiting, the system extension opened in July 2012, offering service several times per hour on the new MetroRail Orange line. Riders from northern stations (including the Tri-Rail station) may take the Green Line to Earlington Heights and transfer to an airport-bound Orange Line train. With the addition of the Orange Line, Miami-Dade Transit now offers long-term parking designed to serve passengers traveling to the airport for extended trips. This parking is available at the Okeechobee, Earlington Heights, and South Miami stations. There is a 2-day minimum and a 30-day maximum for these long-term lots. You may purchase long-term parking in advance by either calling the EASY Card Center at (786) 469-5151 during business hours, visiting the Government Center MetroRail station or the Overtown Transit Village building, or paying online at the Transit Store. If you already hold a monthly MetroRail parking pass (available to holders of monthly MetroPass tickets, the Golden Passport or the Patriot Passport), you do not have to pay extra for long-term parking. The $10 MetroRail parking pass fee covers your trip.